John Calvin: Did You Know? Calvin’s early training was as a lawyer and his first published book was an academic commentary on the ancient philosopher Seneca. Although neither were Protestants, both Calvin’s father and his brother Charles were excommunicated from the Roman Catholic Church. 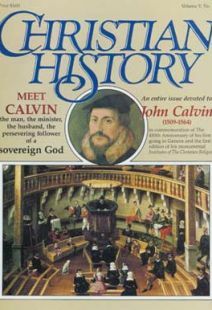 Calvin was not granted citizenship in Geneva until five years before his death in 1564. He had been the city’s most famous person for over twenty years. Calvin married a widow with two children. After her death in 1549, he raised her two children as his own. Calvin encouraged congregational psalm-singing in the church at Geneva. Calvin viewed music as a gift of God, and even put to music a number of the psalms himself. Nearing his journey’s end, Calvin gave strict instructions that he be buried in the common cemetery with no tombstone. He wished to give no encouragement to those who might make it a Protestant shrine. Today, his grave site is unknown. Once when Calvin was sending a letter to his close friend Pierre Viret by one of a pair of students, he noticed that the other was a little jealous at not being the messenger. Calvin quickly dashed off another letter to Viret. The letter contained only the request that Viret pretend it was a valuable letter. During the course of his ministry in Geneva, lasting nearly twenty five years, Calvin lectured to theological students and preached an average of five sermons a week. This was in addition to writing a commentary on nearly every book of the Bible as well as numerous treatises on theological topics. His correspondence fills eleven volumes. Calvin was above all a pastor.